…when the books come in a bunch. Long, slow days at work and my book is comfortably sitting on my bedside table at home. Of course, like any good bookworm, I do have some e-books on my phone for this precise occasions. I honestly didn’t spend much time choosing a book. I simply took the first on that showed and got to it. By the time I got home after work, I had two chapters to go. How crazy is that?! So, of course, I had to finish the whole thing and figure out if they rescued the doctor and if they all lived through it. It wasn’t even that I had nothing at all to do at work, it was simply a longer day than average, slower than expected. And that was time enough to finish a short book. Maybe I should try reading more short and easy books. That’s what was going on through my mind when, the next day, during another of those days, I simply started another short and easy book. By the time I got home, I had finished that one already and was halfway through the sequel. Downside? Now I have two more book series to add to my TBR list. And then I started to notice something. There are book series everywhere! They’re everywhere! What’ up with that? I know I’ve said it before, but I hadn’t realize how few of my book are actually stand-alone stories. Even some that I thought were stand-alones, aren’t anymore. How crazy is that? As many book addicts out there, I have a tremendously long list of books waiting to be read. A list that keeps on growing way faster than I can actually read them. Usually, when I hear of a book that might-could-possibly-maybe-likely to be interesting… I add it to the CHECK ‘EM OUT list I keep in my bullet journal. From there, I look them up and stay on the lookout for those titles every time I visit the bookstore (be it at the mall, or the digital kind). Once I get my hands on them, I add them to another list I keep of all the books I want to read… that’s my actual TO BE READ list, and that’s how it grows and grows non-stop. Clear up my to-be-read list from all book series. Starting with the already-started ones and then moving on from there, until it takes some searching to find a book part of a series in the first 50 names my list. That’s the goal… Let’s get to it! There is still a week to go, but the year is almost over and I’m calling it already. And, unlike last year, this year’s goal was achieved ahead of schedule. Something that still make me smile everytime I think back on it. While I was going over the whole of the books crossed out of The List, I realized that the first days of 2016 caught me with a half-read book that had to be put down in account to lack of reading time. Just as the end of the year will see me. Talk about going full circle! It might all be a strange coincidence, but I’m inclined to think that it has something to do with winter always being the busy season (and not just with work). Last year’s unfinished book, The Witch’s Daughter, remains so… Not having made it back to the To-read List… Which doesn’t bode well for this year’s Graceling and Truthwitch, that I’m supposed to be reading right now (but can’t really remember how the characters got to where they are). …does it make you feel as guilty as it makes me feeling? Anyhow… I’m still quite proud of myself, regardless of unfinished books. Now I can honestly say that those who read less than five books in a year, are simply not interested in reading. I mean, just check it out! 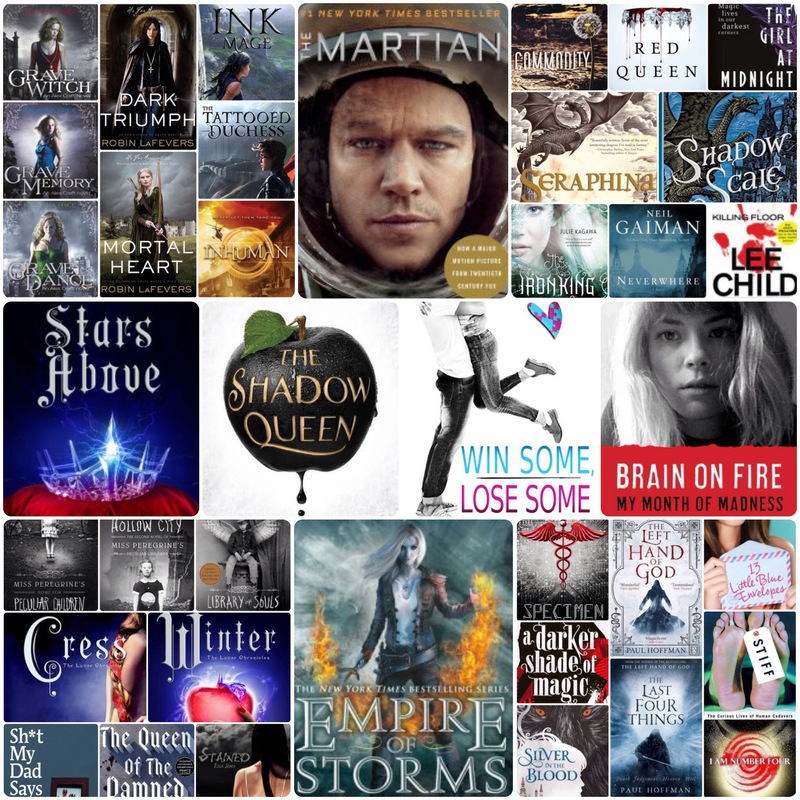 It all added up to almost 40 books this year. And I feel a step closer to being ready to take the Goodreads Challenge. Is other people as fascinated as me for the lives of royalty, be it real or fictitious? Or is it just a coincidence? I think one of the best places to look for strong and fierce female characters is in Royalty stories. Not to say that I’m not often disappointed, and equal often pleasantly surprised with non-royalty-related stories. There have been quite a few Queen-related book on my To-Read list this year, and now is the turn of The Shadow Queen by C.J. Redwine. Let get to know some new Royalty. I’m sure I’ve said this before, but I think audiobooks are the best company when the times comes to do housework. I don’t really like silence that much if I’m not reading, so I need some kind of background noise. Mostly that’s when I put on my headphones and get lost on the sounds of whoever might be reading the book to me… but if not, then music is usually my companion. I don’t consider myself a shy person. I don’t have any difficulties talking to people of even making friends, but I do enjoy being alone. My family tends to worry about me and I’ve met people who told me that i could do so many better things with my time… but I enjoy being by myself. it doesn’t make me depressed or sad, it just feel refreshing and like cool rain after a very hot day, if that makes any sense to you. Being alone makes for the best circumstances for listening to audiobooks. I can just click play on my device and take my portable speaker wherever in the house I go. I can be in the kitchen cooking, or in the backroom doing laundry, or all over the place mopping… and nothing interrupts my “reading“. Of course, this doesn’t quite work when I have visits, and even the cleaning of the house becomes team work. But something good came out of all this. When I began reading A Darker Shade of Magic, I wasn’t quite liking it. The main character, Kell, felt to melodramatic; and the prince, Rye, was too much of an over-grown child. It wasn’t until I met Delilah that I stop considering ditching this book. But then I had to put the book on stand-by and got to reading Stained and Killing Floor. You know how that turned out: I hated both of them. So, when I returned to my audiobook, things didn’t seem so bad. That was one of my favorite parts. We get to see things from the perspective of a creature that the characters are unaware of, and we don’t (until the very end) know who or what it really is. That was pretty cool. I ended up deciding that I do like this book after all, and I will be adding the two sequels to my To-Read list, even if they are not at the top of the list. It might be that my to-read list could be getting to be too long. I have a good number of books (both, the digital and the printed kind) lying nearby in wait (or queued, in the case of my ebooks), ready to be picked up. There is where I found Stained by Ella James. And I honestly have no idea where I got this book nor what it is supposed to be about. I can’t even remember when it made it to my list. Ok. I admit. I have a terrible memory. That’s why I write most of everything down. Me, forgetting things? Totally possible, even likely. But this is not the first book that I picked up without really remembering why I wanted to read it. The title of this book doesn’t even sound familiar, but the author does. That leads me to think that maybe that’s why it is in my list. There is a whole section in my planner for books. It is mostly a huge and almost senseless list of all the books I hear about or see somewhere and I think sound interesting, waiting to be looked up online and for me to decide whether they will make it to THE list. But on top of book titles, there are also a few author names that I also add to that list. When it comes to authors I want to know what the buzz is about, I usually just pick the most talked about book or the one that shows first in my search. I’m really starting to think that’s the case with this book. If it’s all about Ella James, let’s see what she’s got. I confess: my to-read list is easily influenced by online talk and buzz. There has been quite a number of books that I’ve only read because everyone seems to be talking about them. And I’ve discovered awesome books like that, the same way that I’ve ended up reading horrible mind-numbing books. It’s a gamble, you just never know. 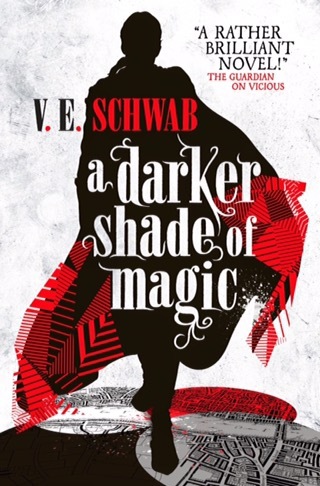 This is how A Darker Shade of Magic by V. E. Schwab gained a spot in my list. I’ve being seeing this book cover everywhere for a long while now, so I thought I’d give it a go. It’s all about magic and wizards, isn’t? It ought to be interesting. I always feel like watching the movie before reading the book means spoiling a completely good story. Don’t you think so? It makes me feel guilty. But most of the times, my to-read list is so long that there’s a bunch of equally interesting books also waiti to be read and that keep pulling my attention away fro those books that have made it to the endless (and growing) list of books made into movies. This time, I’ll try harder to stay ahead of the book eating monster, called Hollywood, that shreds and destroys amazing stories, while still making us hope that someday it may be able to gift us something better that what our minds can conjure up. And I’m doing it with Miss Peregrine’s Home for Peculiar Children by Ransom Riggs. I’m not even sure what this books is supposed to be about. I know I must have read a summary of it before choosing to add it to my to-read list, but I honestly cannot remember. Hopefully the reason why I thought this would be interesting will present itself to be while actually reading it. Keeping on with the supernatural. You wouldn’t believe how many books I have waiting on my shelves (both the wood one and the digital one). It kind of makes me feel like a terrible host. I invite them into my home, and then neglect them and let them to collect dust. It just seems rude, and it would drive me crazy if I had to sort trough all of them to choose one to read everything I finished a book. That’s why I keep a list of what book to read next. Of course this list gets corrected, augmented and patched up often, but it gives me a sense of order and structure. That said, I actually ignored the list completely when picking this book. It was a spur of the moment choice, something that just felt it might fit my current mood. Witches, ghosts, cops and mystery… what can go wrong, right? 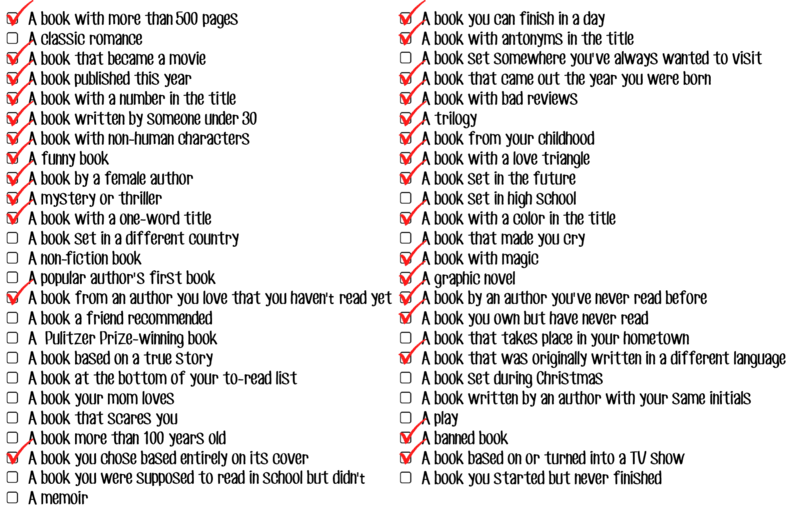 As I’m sure you’ve noticed, I spent the whole (or at least the most part) of 2015 trying to complete this Reading Challenge. I even made a checklist to encourage myself! And as I’m sure you have also noticed, I did not succeed. But I’m not that heartbroken about it. My main goal was to make a dent on my huge (and always growing) to-be-read list of books and I did read more books that I was hoping to… Even some that had been waiting for some time to be picked up. Of course, the list continues to grow and I’m already looking forward to a new year of reading.